Funeral Services honoring David’s life will be held on Saturday, February 9, 2019. A Mass of Catholic Burial will be celebrated at 11:00 a.m. at St. John the Baptist Catholic Church, 1501 172nd Ave., Union Grove. A visitation for David will be held on Friday, February 8, 2019 from 5:00 p.m. until 8:00 p.m. at the Piasecki-Althaus Funeral Home, 3720 39th Avenue, Kenosha,WI and on Saturday, February 9th at the church from 9:30 a.m. until the time of the Mass. In lieu of flowers, memorial remembrances to Hospice Alliance, Inc., 10220 Prairie Ridge Blvd., Pleasant Prairie, WI 53158, would be appreciated. 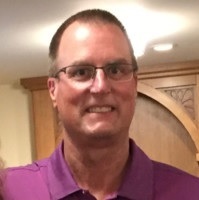 David James VanKammen, fondly known to many as DVK, passed away at age 53 on Saturday, February 2, 2019 surrounded by his family at Hospice Alliance’s Hospice House. David’s career began and ended at Domino Amjet in Gurnee, IL where he worked with his loving and supportive Domino family for 31 years. Along with friends and coworkers, he also met his wife of 21 years at his place of work. On August 16, 1997, he married Laura Stein at St. Mary’s Catholic Church in Kenosha. Aside from work and family, David’s other passions included various outdoor sports; in his freetime, he enjoyed golfing every day he could, annual fishing and hunting trips, and tending his meticulously planted rows of vegetables in his garden. A dedicated Boy Scout leader and Order of the Arrow Eagle Scout, David prominently displayed the qualities attributed to the group in everyday life. Being a “Dutch-German Engineer,” he possessed an uncanny ability to fix anything and had a particular affinity for computers, knowing various code-languages that would make sense to few others. When not working on a personal project or hobby, David thoroughly enjoyed spending as much time with his family as he could, whether it be cookouts where he could proudly share samples of his famous wings or watching the latest Marvel movie with his daughters. He is survived by his loving wife, Laura; his two daughters, Elizabeth and Catherine; his mother, Barbara Beaulieu; his three brothers, John, Michael (Jane), and Robert (Heather) VanKammen; his step-brother, Dave (Lanelle) Beaulieu; and many aunts, uncles, cousins, nieces, nephews, in-laws, and friends. He was preceded in death by his father, James VanKammen; his step-father, John Beaulieu; and godson, Daniel Stein. The family would like to express their gratitude to David’s aunts, Carolyn and Julie, Dr. Haider, Dr. Jandali, Dr. Montemurro, Aurora Cancer Center, Faith Clinic at Froedtert Hospital, his family at Domino Amjet, the Strawberry Creek Community and Shore Haven Association on Lake Geneva for the exceptional love and care they provided.